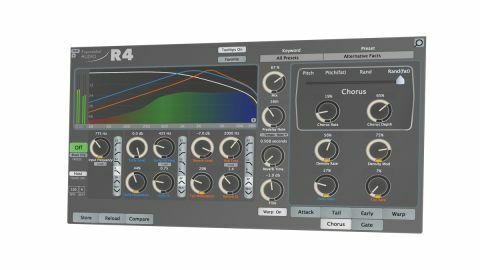 With its colourful, highly malleable sound, extensive feature list and straightforward interface, R4 is EA’s best reverb yet. Deep, deep control and modulation. A couple of the knobs would work better as buttons iLok 2 required for demo version. Billed as a “character reverb” alternative to the super-transparent Nimbus, R4 (VST/AU/AAX) is a big brother to R2, itself a beefed-up sibling of PhoenixVerb. Essentially, it’s the new flagship reverb in ex-Lexicon developer Michael Carnes’ Exponential Audio range, and if you’ll forgive us the spoiler, it’s glorious. R4 looks and is laid out very much like Nimbus, but with the addition of Modulation controls to the Early and Tail filter sections, and additional Chorus and Gate section tabs on the right. It’s from these new parameters that the wobblier, more expressive side of R4 emerges, immediately setting it apart from Nimbus, which has no controllable modulation at all. The three filters enable low-pass, high-pass, band-pass and notch filtering of the Input signal as well as the early reflections and tail, and the Chorus module can be used to modulate the Early and Tail filter cutoffs, along with the pitch of the tail itself. Intended to bring optional analogue and vintage digital vibe to R4’s table, the Warp section is home to a compressor/expander and two flavours of distortion. The compander’s Compression knob sweeps from -24dB to 24dB, applying the selected amount of gain reduction or boost when the Threshold is exceeded. 11 Knee shapes affect the onset of that gain change, and 2-50ms of Attack and 30-15,000ms of Release time define its envelope. The analogue-style Overdrive comes in three flavours - Warm 1 and 2, and Crush - and a crossover frequency can be set between 45Hz and 4kHz, above which the volume level of the wet signal is adjustable, should you wish to bias your distortion towards the low-end. On the digital mangling side, the Word Size control ranges from 12-bit to 24-bit in 2-bit increments - just the thing for a touch of lo-fi grunge. It features four base modes for setting the phasing and behaviour of its underlying LFOs, and separate Rate dials for each of its three targets (pitch, Early and Tail). Also housed in the Chorus section are Rate and Depth knobs for the tail density modulation that largely defines the all-new Hall 2 algorithm - an alternative (and rather lovely) style of motion whereby the thickness of the sound changes over time but the pitch remains unaffected. The other three algorithms comprise Plate, Chamber and the chorused Hall that Exponential Audio fans already know and love. The parameter-packed Gate, meanwhile, is used to shape the decay envelope of the tail in exquisite detail, for 80s-esque drum sounds and the like, or less obvious treatments. Also totally new to R4 (and long overdue in the Exponential Audio line-up in general, we’d say) is the Freeze button, which holds the wet reverb signal indefinitely when activated, while still allowing the dry signal - and, optionally, early reflections - through. Cinematic sound designers rejoice. Beyond that, all of the great stuff found in Nimbus and its predecessors is present and correct: the Attack and Early Reflection envelopes; the separately adjustable Tail and ER widths; the brilliant Tail Suppression (ducking – keyed off the Input, Output or Both); six ER patterns (four of them new for R4); the ability to time the early reflections freely or synced to host tempo; the Warp section - see boxout - and more. Also like Nimbus, R4 includes an enormous library of over 1200 searchable, filterable presets, the vast majority of them divided into groups of standard, Dark, Lite, Narrow and Wide variations. Much as we love Nimbus, R4 feels like a whole new ball game, sonically. Thanks to the filter modulation, Hall 2 algorithm, Gate and Freeze function, it just offers so much more than its comparatively sedate stablemate in the way of creative potential. From the biggest, most epic of halls to the tightest, funkiest of plates, the amount of sculpting control placed in the user’s hands is simply incredible. In summary, R4 is classic-style algorithmic reverb perfected - we honestly can’t fault it.